The thunder of the Spokane River: One of the many sounds that accompanied today’s bicycle rides. The first sound I heard in today’s biking went something like “ksh-ksh-ksh.” This turned out to be the rubbing of my front fender against my tire, a sound most likely caused by my bike falling over the day before and knocking things out of kilter. You’ll learn the sounds that your bike usually makes and be able to detect something that doesn’t sound right. This “funny sound” indicator tells you to check the bike over for something loose, something rubbing, something that won’t work as expected. We stopped several times on our pedal to Rockwood Bakery for quiche but never got the fender adjustment to stay in place, so when we got back to our host’s home we simply took the fenders off. We’re in Spokane, it got up to 67 degrees yesterday, odds are good I don’t need them. Sound next entered into my bike day at the Spokane Bike Swap. In talking about training techniques, someone suggested doing one-leg drills with your eyes closed and listening for what it sounds like when your pedaling with one leg matches your pedaling with the other leg, rather than relying on instrumentation. As I do not do many one-legged drills myself, I share this in case it helps you. Next up: the Belles and Baskets ride. 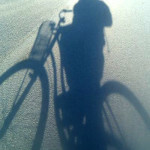 If you travel to Spokane you’ll want to take this bike ride for sure to see beautiful scenery in the heart of the city. A dozen of us met at Chairs Coffee on Indiana for a beautiful route looping the Spokane River on both sides. 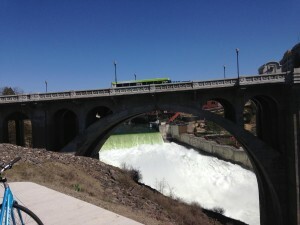 We rode south on Howard to Riverfront Park and over the Spokane River that runs through the heart of downtown, its spring waters thundering underneath us. From there we rode through historic Browne’s Addition and dropped down Riverside Avenue to reach the Sandifur Bridge and ride over the river again. We climbed the switchbacks to what used to be a bumpy gravel road. Now the trail continues thanks to Greenstone Homes and its completion of a missing link through the new Kendall Yards development. March 18 I attended the Futurewise spring awards luncheon and clapped as the Excellence in Creating Livable Communities Smart Growth and Transportation award went to the City of Spokane and Greenstone Corp. for the Mile 24 Kendall Yards Gap project. And what an incredible gap they closed! The sound of thundering water accompanies the view of the river through the arch of the Monroe Street Bridge. The trail winds past new restaurants like Central Food, opened by bicycling chef David Blaine, where people laughed and talked on the deck in the sunshine. I kept marveling as I rode that such a fantastic connection has been added. Across the river on the south bank I caught a peek of the new Huntington Park developed by regional utility company Avista. We pedaled on through Riverfront Park, crossing from the north to the south bank with the river roaring beneath us yet again, and upstream past the Riverpoint Campus where I used to work. We crossed the river twice more in a quieter stretch: On the Don Kardong Bridge (named for the Olympian and founder of Spokane’s Bloomsday run) and the new Iron Bridge, a reclamation of an old railroad bridge. Here the sound was a quiet chuckling, not the roar of the falls. All along the way the sound of happy chatting accompanied the changing sounds of the river, the sounds of shifting and pedaling, the pad-pad-pad of runners along the trail, the music of the Looff Carousel in Riverfront Park, the honking of geese on the riverbank at the Iron Bridge, and the other sounds that told me I was outdoors, in a city, and with friends, all thanks to the bicycle. Have you used the “funny sound” method to diagnose a problem with your bicycle? What’s the most interesting, most beautiful, or strangest sound you’ve heard while riding your bike? 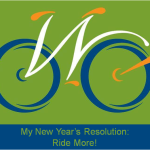 This article was posted in Adventure, Attitudes, Rides, Spokane County, Travel, Women. Bookmark the permalink. Follow comments with the RSS feed for this post. Both comments and trackbacks are closed. Judging by my daughter, Isabella’s reaction was sparked by the sound I made in response to the giant raptor swooping down towards her. You see, we were riding to swim practice in Moscow, a 15 mile round trip for us, with freshly popped popcorn in her backpack. The hawk, eagle, or whatever type of large bird it was, had been following us for a few miles. We kept an eye on it, but Isabella grew increasingly nervous as the bird started to fly closer and closer to her each time it circled. The last time, it seemed to be in a dive bomb (this is what I saw as protective mother bear) towards her, so I let out a loud, scary sounding KA-KAWH KA-KAWH! I’m not sure what scared Isabella more…the bird coming at her or my crazy bird, defense call. Another reason bicycle riding together is so important…you can learn primal survival skills. Note to self and others: when biking in the outdoors, don’t bring along freshly popped popcorn!